A pigeon in a pie is better than two on the bog! 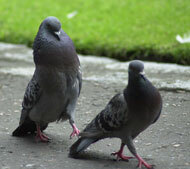 Cadiz, Spain: Cadiz local council are following London's Trafalgar Square by banning pigeons from the city centre. 5,000 Spanish pigeons have been ordered out of town, and if they dare come back, they'll be put into pies and sold to hungry tourists instead of cheap pizzas. Pigeon crap is a massive problem for the city and piles of the stuff is causing tourists to slip, while low-flying pigeons are terrorising pedestrians. Authorities have collected the local 'dive bombers' and relocated them to the countryside, 200 km away. There is only one slight problem, as all pigeon fanciers well know, pigeons have a knack for finding their way home. The Cadiz authorities have been advised by ornithologists about the remarkable skills of pigeons returning to their homes. So, to prevent another invasion of utter crap (just like this spoof - hey, at least I'm honest), the local council have released several hundred hungry stray cats to catch the enemy. Many tourists are now complaining of stinking cats poop stuck on their sandals, so, stray dogs are being employed to run them out of town. The mayor of Cadiz, an elderly lady who famously once swallowed a fly, declined to comment. It's a never-ending trail of crap here on The Spoof!